Best wishes from Ohrstrom Library for a restful and restorative Winter Break! The library will be open Wednesday, December 16th, and Thursday, December 17th, from 8:30 am to 5:00 pm. The library will be closed from Friday the 18th until Tuesday, January 6th, when we will be open from 1-5 pm. The complete calendar of hours is available HERE. The library’s digital collections are always open! If you are off the grounds for the break, please first log in to vpn.sps.edu to gain access to the library’s digital collections. Have a wonderful Winter Break. The library is looking forward to seeing you – and researching with you – in the New Year! 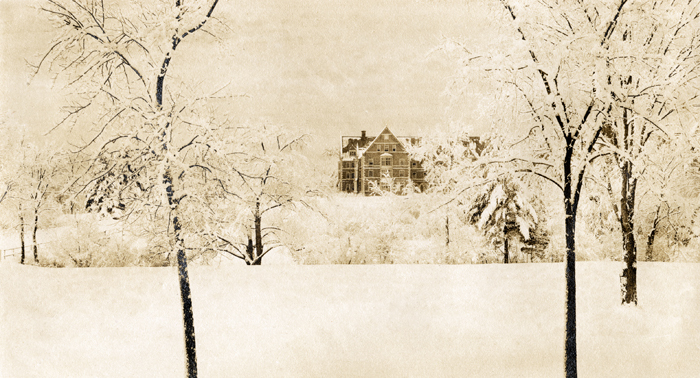 This wintery scene is a photograph from the St. Paul’s School archives collection, taken on March 23, 1911, at 7:00 am by Mr. J. M. Kendall. Titled “From the Lower School Common Room”, this view of the New Upper (Coit) was taken from the area currently occupied by the Nash dorm, where the Lower School was originally located. Welcome back and welcome to new students beginning the St. Paul’s School experience. The library is happy to see you! Feel free to drop in for a physical book or DVD. Stop by in the evenings for a quiet place to study. When are we open? Generally, the library doors are open 7:45 a.m. – 9:55 pm with slight variations for weekends and Wednesday mornings (no Chapel!). A complete description of the library’s operating hours is available here. The library site is home to our digital collections including collections of ebooks, eNewspapers, eJournals and streaming independent film (plus much more)! These digital collections are of course open all the time 24/7/365 from anywhere around the world. If you are off-campus and need to access any of the digital library material, please first log in, with your SPS username and password to http://vpn.sps.edu. Welcome to a great new school year! 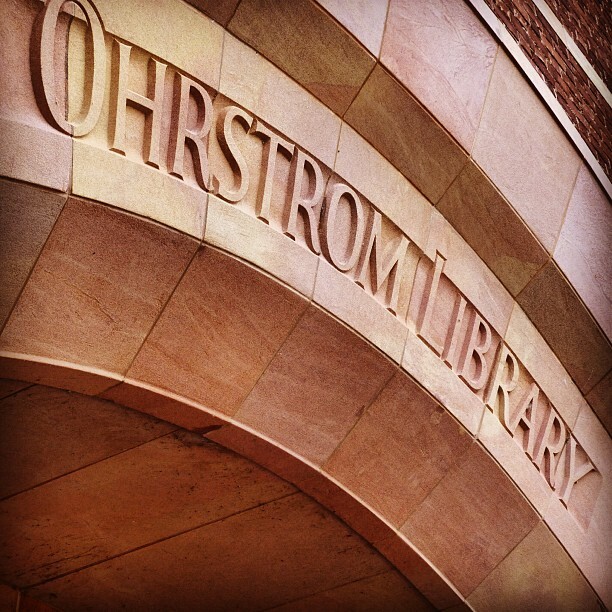 Just a reminder that Ohrstrom Library is open Thursday December 17th and Friday December 18th from 8:30am to 5:00pm. Beginning on Saturday December 19th the Library will be closed through Sunday January 3rd. Come by, browse and borrow some recreational reading, listening, or viewing to enjoy during your well deserved break. We would love to see you, and many many thanks for being such a warm and supportive Library community. Sincere best wishes and happy holidays from all of us at Ohrstrom Library. As always, you can see the Library hours HERE, or by clicking the link in the menu at the top of the page. Image courtesy of aimilino01 under this Creative Common license. While SPS students were off on their own summer adventures the Ohrstrom Blog took advantage of the down-time to make some improvements. The summer months were jam-packed and fun-filled for the blog and now it has a new look and offers some great new features to enhance the users’ experience. You may already have noticed the new poll feature located in the sidebar on the left asking the question: “How many books did you read for fun during your summer vacation?” Take a moment now to submit your answer the poll and be sure to return to see how your choices compare within the larger results. New polls will be added on a regular basis so check back often. Additionally, a visually interactive Library calendar has been added. You can access the calendar through the “Hours” link in the top menu above or through menu in the Library website. Running your mouse over the day block on the calendar will show you the hours the library is open for that day.